Having an outdated kitchen is sort of like sporting a mullet. That is, you think you look fine, but in reality, people are pointing and laughing at you. Look, perhaps there was a time long ago when mullets were actually in, they were cool to wear as a hairstyle. The problem is that time has long passed and you need to update the do. The same holds true for your kitchen. What looked very nice twenty years ago is now just an eyesore, just ask anybody who has seen your kitchen. And while there are obvious looks that are outdated, like harvest gold sinks, Formica countertops and linoleum flooring, many aspects of your kitchen are outdated, but less obvious. For example, backsplashes that reach only six or eight inches above the countertop are dated, backsplashes that go all the way up to the cabinets are in. The same holds true with fluorescent lighting under the cabinets; that is just so 1990s. And if you still have overly distressed and glazed cabinetry, you need to get with the times. Those went out of style the same time acid-washed jeans become passe. It might not be obvious to you, but you need to update your kitchen. 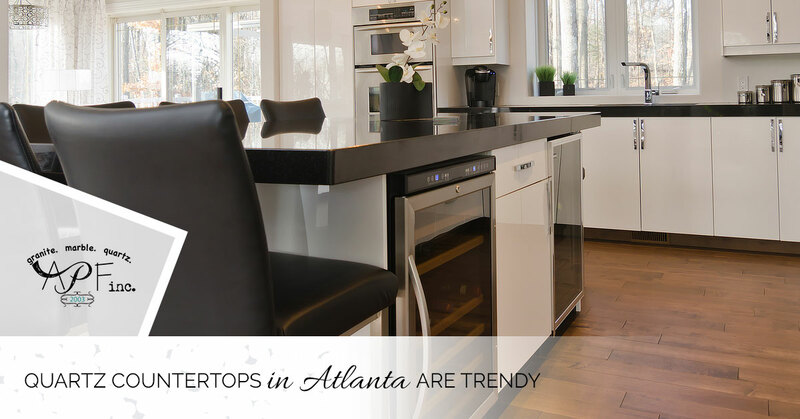 A Polished Finish, your source for quartz countertops in Atlanta, offer kitchen trends you should consider. Quartz is the trendiest material for countertops at this very moment and it will be for quite some time. Quartz is stunning to look at and it is very easy to maintain. And unlike granite, which is porous, quartz is highly resistant to stains and is extremely hygienic. In addition, quartz is very low maintenance. Best of all, quartz comes in a variety of patterns, colors and finishes. So if you are interested in having a kitchen that is fashionable and durable, then seriously consider having quartz countertops installed. If you are thinking about painting your cabinets, you need to know that gray is the new white. Another kitchen trend is taking a step back from white and embracing gray cabinets. Combining cabinet colors is also a trendy look that is definitely worth looking into. The color of kitchen cabinets isn’t the only thing that is changing, so is the way we open and close them. Hydraulic doors that fold up and out with a touch of a button are all of the rage. These types of doors are perfect for kitchens where space is an issue. Kitchen sinks are like cabinets as they trend colors as well. People are starting to trend away from white sinks and now prefer colorful sinks. A colorful sink is a great way to add a pop of color to your kitchen with gray cabinets. You will also want the backsplash to have the same color as your sink. Popular colors include maraschino and mint. Oversized light fixtures create excitement and give a great sense of depth perception. Basically, large light fixtures create drama within a kitchen. In addition to cabinet doors that open at the touch of a button, trendy kitchens utilize technology in other areas. The kitchen of the future has sensor-activated lights, hands-free faucets and an app that lets you know when your meatloaf has reached the proper temperature. Apron-front sinks come is a variety of colors and are still in style. We say they are still in style as they have never really gone out of style and have been a favorite for many throughout the years. In addition to the classic look, these types of sinks are practical as they are deep enough to hold large pots and pans for easy cleanup. If you do choose gray or a light paint color for your cabinets or walls, a dark floor will give your kitchen a huge cozy factor. A big, metal hood can be the centerpiece of your kitchen if it is dressed up accordingly. This means adding metal straps and rivets to it to add age and warmth. If you are ready to turn your kitchen into a trendy, modern masterpiece, start by contacting A Polished Finish and having your countertops upgraded.